In 1929 the city, the State of New York and the New York Central Railroad agreed that something had to be done. 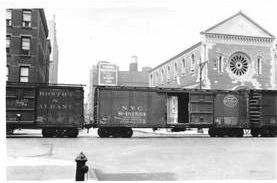 The freight trains that had run up 10th Avenue since the late 1840s caused so many accidents and fatalities that the thoroughfare was termed Death Avenue. “West Side Cowboys,” horsemen with red flags, rode in front of the oncoming trains to warn pedestrians and vehicles. But it wasn’t enough. ﻿ The heavy street congestion forced the group to authorize elevating the train tracks, removing the danger altogether. The $150 million project (more than $2 billion today) would eliminate 105 street-level railroad crossings. It would also eliminate the Church of the Guardian Angel. 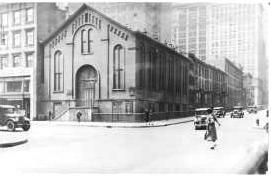 Sitting on 23rd Street just east of 10th Avenue, the church was directly in the path of the planned project. Built in 1910 and designed by George H. Streeton, the Roman Catholic church served neighborhood as well as the stevedores and seamen from the piers two blocks away. 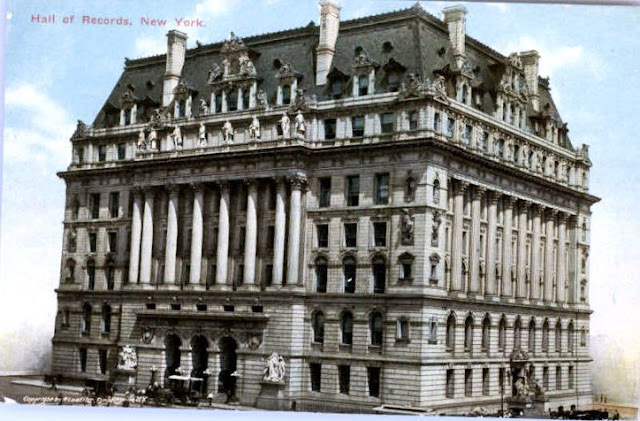 The New York Central Railroad, reportedly, paid for the relocation to 193 10th Avenue, two blocks south. John V. Van Pelt was given the commission and his resulting structure is striking. Working in the Southern Sicilian Romanesque style, Van Pelt used the Clunic Abbey of Saint Peter in Moissac, France as his inspirtion. Using red brick trimmed with limestone, he copiously embellished the exterior with bas reliefs, pillars and a deeply-hooded entrance. 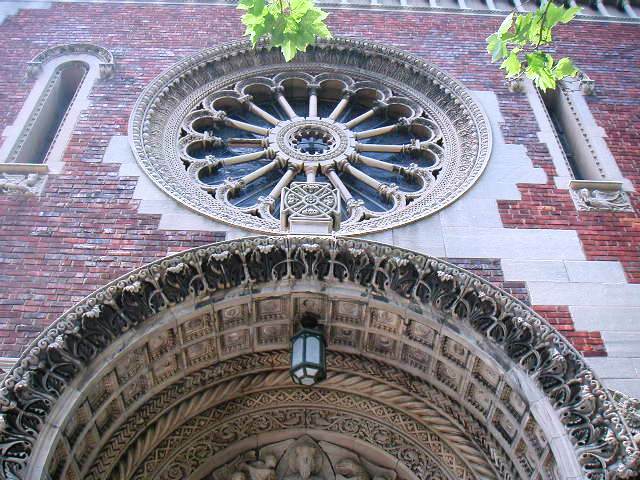 A large and complex rose window dominates the 10th Avenue façade. Inside medieval stone columns and an exposed beamed ceiling add to the early Sicilian flavor of the building. 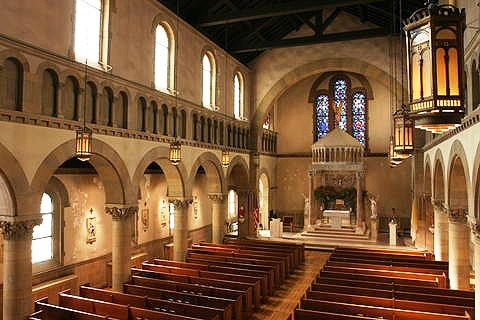 The church was completed in 1930 and dedicated with a pontifical mass on November 8, 1931 celebrated by Cardinal Hayes with the mayor in attendance. Outside the freight trains still rumbled down 10th Avenue, directly in front of the new church. When the elevated tracks – later to be known as the High Line – were completed three years later, they came within mere feet of the chancel windows to the rear of the church. In 1980 the last freight train, carrying three carloads of frozen turkeys, ran along the High Line behind Guardian Angel. For two decades the tracks would remain abandoned and overgrown before being recycled into a public park which opened in 2009. Today the piers and stevedores are gone, the clattering trains are a memory, yet the Church of the Guardian Angel continues its work in the much-changed Chelsea neighborhood. Now surrounded by art galleries and cafes, it is a rare example of Sicilian Romanesque architecture and a delightful surprise to High Line visitors. "The Travel Channel" described the church spot-on saying "New Yorkers, numbed by constant grandeur, too often pass architectural gems without noticing. But buildings such as this one deserve attention." The streets of Greenwich Village, essentially unaffected by the grid plan of 1811, wander this way and that, often creating a tangle of angles and intersections only the veteran Villagers can easily maneuver. On the triangular-shaped block where West 4th Street angles sharply northwest from 6th Avenue towards Sheridan Square a charming row of Federal style houses terminates with two surprising and unexpected buildings. Here in Manhattan sit two quaint Georgian-looking houses, like a slice of old London transplanted into New York. Their cozy, antique appearance exudes the romance of a Currier & Ives lithograph of 18th Century domesticity. They are in reality only about half that age and their beginnings are not so romantic. The little two story house at No. 185, which deftly appears to be a single story, started out life as the carriage house for the owners of a townhouse on Washington Place. In 1917, as horse-drawn carriages gave way to motorcars and Greenwich Village saw the beginnings of its Bohemian attraction, it was converted into a residence. The architect, reportedly named Fayerwhether, embraced the Colonial Revival style that had become trendy with the 1876 Centennial and would last for another few years. 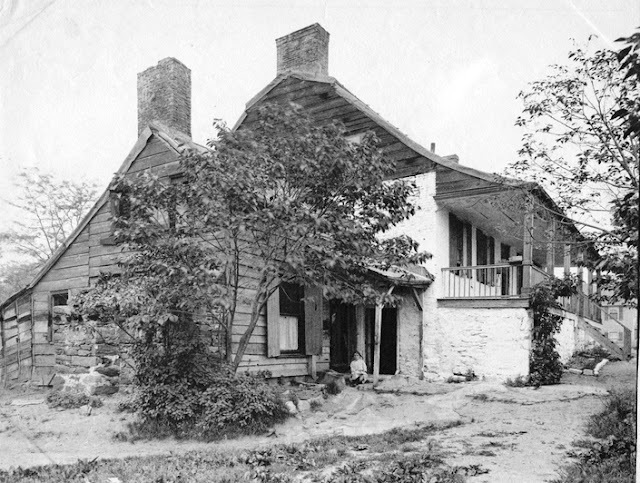 A simple arched doorway topped by a fanlight and two multipaned windows with paneled shutters gave the little house a Revolutionary period flavor. As the renovation was being completed, Annette Hoyt Flanders was serving with the American Red Cross in France, during World War I. Flanders earned her B.S. degree in botany at Smith College in 1918 before leaving and would go on to study landscape architecture at the University of Illinois, civil engineering at Marquette University, and design, architecture and architectural history at the Sorbonne. She became famous through landscape architecture and opened her own office in New York in 1922. Around this time she moved into No. 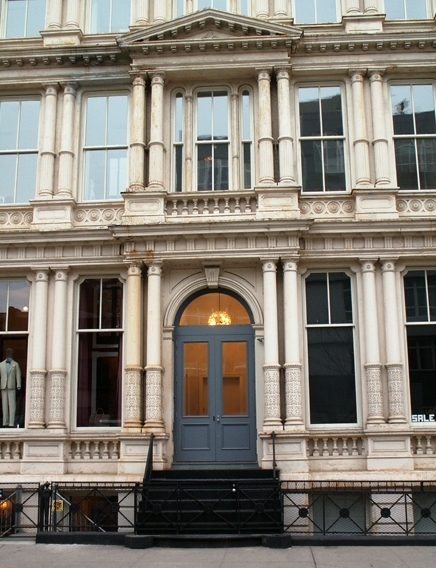 185 West 4th Street. In 1936 the little house got another facelift when it acquired its modified mansard roof with Chinese Chippendale railing. Grills set into the broad cornice board disguise the small windows of the second story and echo the railing’s motif. In 1917 the Buildings Department documented the construction of No. 183, next door, noting a “one floor studio with mezzanine.” The artist’s studio was architecturally compatible with its little next door neighbor and as the decades passed, both served a succession of artistic owners and tenants. By 1962 when wealthy art dealer Armand Hammer discovered the two buildings, No. 185 had “two one-half apartments on each floor.” Hammer purchased both structures on October 15, 1962 and set about converting them into a single home (on the same day he purchased three contingent Federal houses on Washington Place). Jazz-loving Hammer used the home as his downtown getaway, within walking distance of jazz clubs, for nearly four decades. In 2000 his estate sold the property to esteemed architect and designer couple Anne Fairfax and Richard Sammons. The peculiar pie-shaped form, the odd angles and unintended joined interior spaces created a challenge. 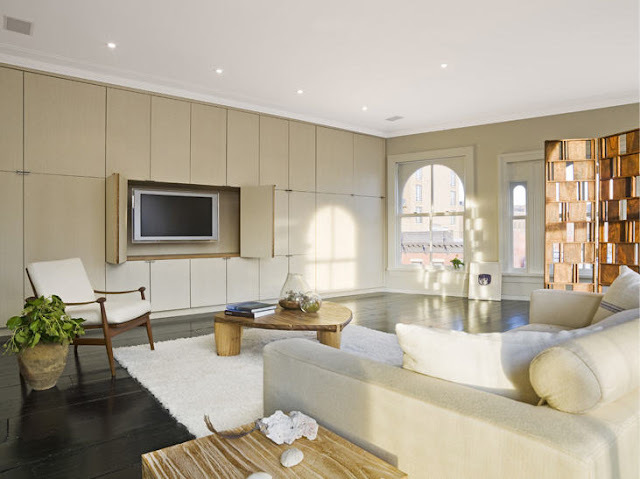 Fairfax worked with decorator Marina Killery to create a sophisticated residence that respects the history of the buildings and the Village. Extra charm was effected by shrubberies and flowering plants, designed by landscape architect Charles Stick. Nos. 183-185 West Fourth Street are indisputably two of the most charismatic and unique buildings in Manhattan and the surprising residence behind the front doors is matchless. 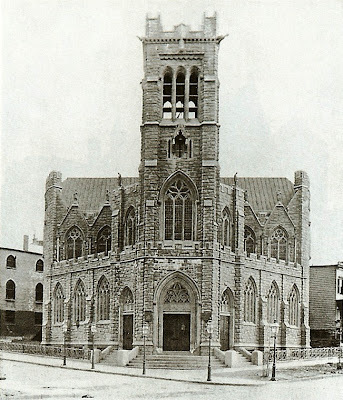 In the spring of 1852 the Rose Hill Baptist Church moved into their new structure at the corner Lexington Avenue and 30th Street, changing its name to the Lexington Avenue Baptist Church. The red brick church, begun around 1849, was handsome and unassuming in the Lombardian Romanesque style. 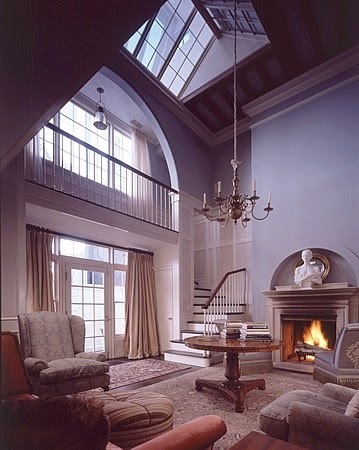 Tall arched windows on the sides sat in shallow arched recesses formed by brick pilasters. The shapes were echoed in the arched corbel tables beneath the Lexington Avenue eaves. The main space, which could accommodate approximately 500 worshippers, was situated on a high brick basement level. A sideways set of steps led to a decorative, multi-paneled doorway. On May 15 of that year, The New York Times announced that “The Lexington-avenue Baptist Church, (late Rose Hill) corner of Lexington-av and 30th-st., will open their Lecture-room in their new building, the Lord willing, next SUNDAY. Services in the morning, at 10-1/2 o’clock, 3-1/2 o’clock in the afternoon, and 7-3/4 in the evening. The pastor is expected to preach in the morning, Rev. THOMAS ARMITAGE in the afternoon, and Rev. J. L. HODGE, of Brooklyn, in the evening." By 1856 the area around the church was developing. 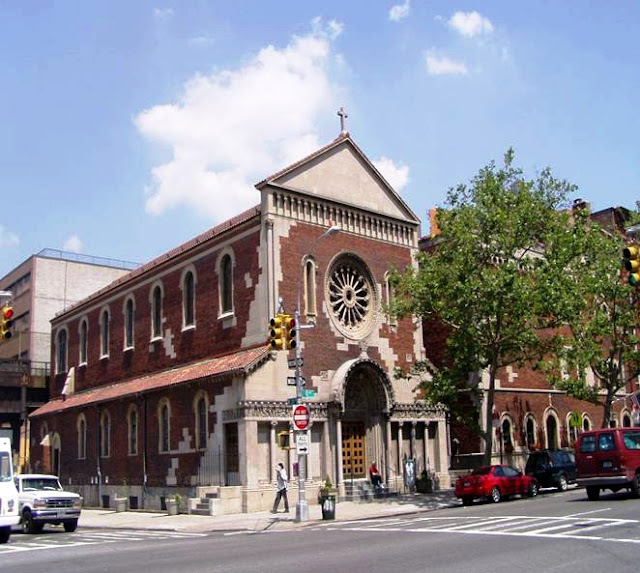 The Times published a list of the many Italianate brownstone homes and several new churches being erected throughout the neighborhood. 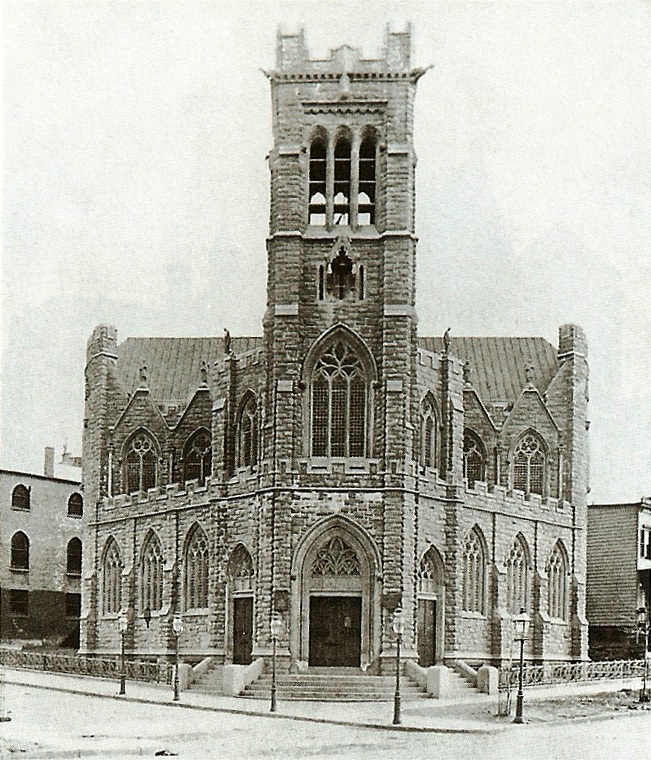 Within four years the Baptist Church had sold their building to the Episcopal Church of the Mediator. 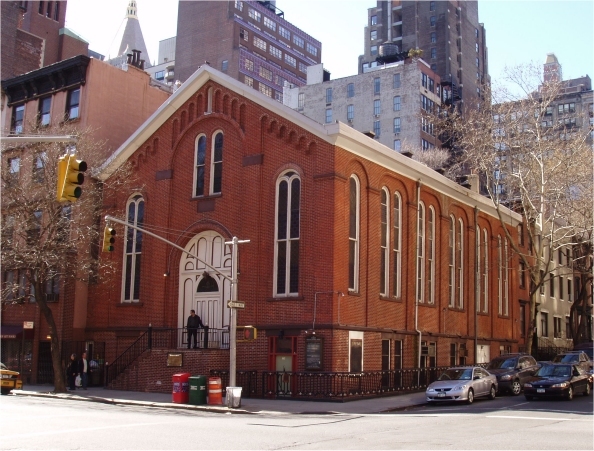 ﻿On February 1, 1869 the Church of the Mediator sold the church to the First Moravian Church for $35,000 and relocated to the southeast corner of 6th Avenue and 34th Street. The Moravian Church, which had been without a permanent building since their Houston Street property was sold in 1865, held its first service in the Lexington Avenue edifice on April 18. The Moravian Church had been in New York for over a century. But, according to Harry Emilius Stocker in the “A History of the Moravian Church in New York City,” it was “in anything but a flourishing condition” when the new church was acquired. 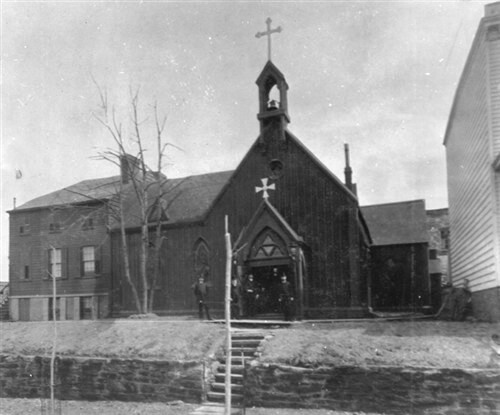 The Moravians were zealous in their missionary efforts and on January 27, 1881 Reverend William H. Weinland gave “an illustrated lecture in the church on ‘Alaska,’ a subject in which he was not only deeply interested but one with which he was thoroly [sic] acquainted because he had made, in company with Missionary A. Hartmann, during the previous year, an exploratory visit to that distant field.” Over 200 people attended the lecture. 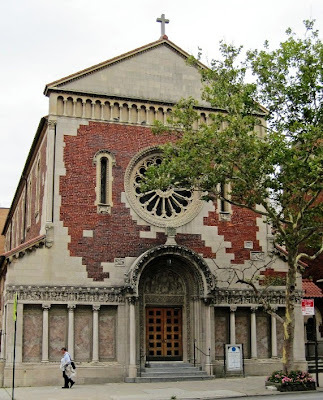 Because worshippers complained that the church was difficult to find, a bronze tablet was affixed to the façade in December 1890 reading “First Moravian Church of New York, Founded A. D. 1748.” “To a certain extent this difficulty was obviated by the tablet,” wrote Stocker. 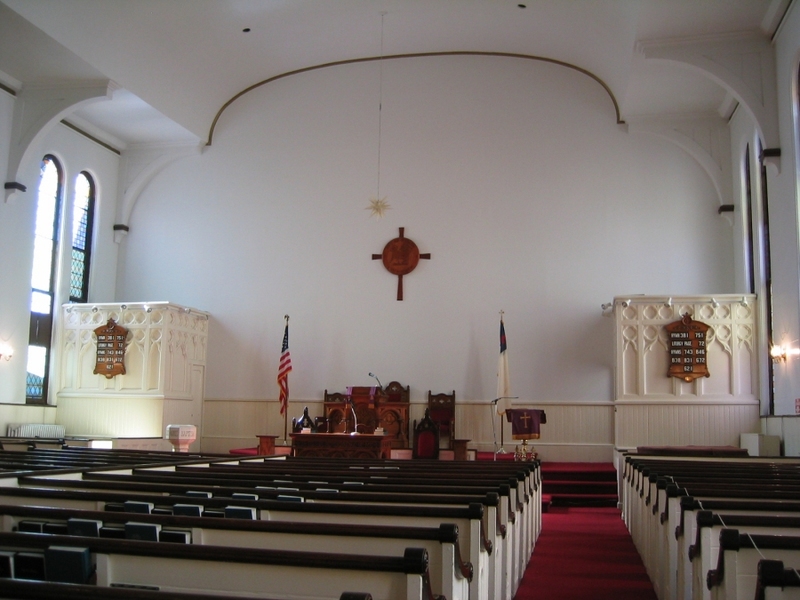 The lecture room was refurnished in February 1893 at which time the first “love feast,” a Moravian tradition, was first celebrated in the Lexington Avenue church. Improvements included new chairs, gas fixtures, window shades carpeting a pulpit and three pulpit chairs. A large space behind the lecture room “hitherto utilized for storing boxes, ash-cans and all sorts of junk,” according to Stocker, was renovated into a church parlor by architect James Grunnert. A concrete floor was laid, the walls “tastefully decorated,” and furnishings such as an oak library table and sectional bookcase were brought in along with portraits of the leaders of the church and other “pictures of historic value.” At the samed time electric lights, a steam heating plant and a kitchen were installed. Today the prim brick church has changed little. 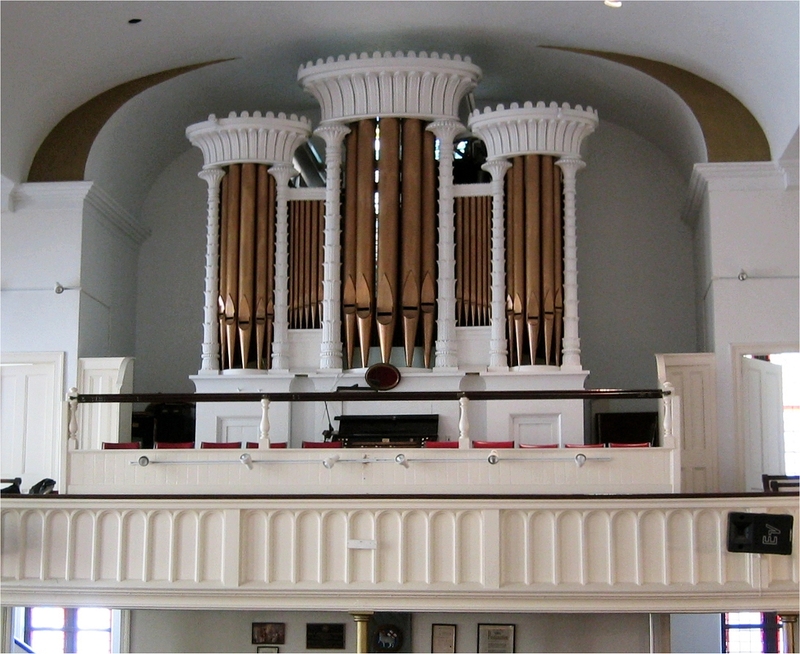 Inside the clean white walls and painted woodwork attests to the simple values of its congregants and the extremely rare and beautiful Henry Erben pipe organ still stands in the organ loft. The Stern boys, Louis, Benjamin and Isaac, sons of German Jewish immigrants, started their dry goods business in Buffalo, New York in 1867. A year later they moved their one-room store to New York City. With apparent marketing genius, the brothers quickly outgrew two stores and by 1878, despite the financial panic that was bankrupting businesses city-wide, were ready to make their mark on Manhattan’s emporium district. As the great stores crept up 6th Avenue from 14th Street, creating what would become The Ladies’ Mile, Sterns Brothers Dry Goods opted for 23rd Street, around the corner. Wide brownstone residences lined most of the block and the imposing white marble Booth’s Theatre anchored the corner of 6th Avenue and 23rd. 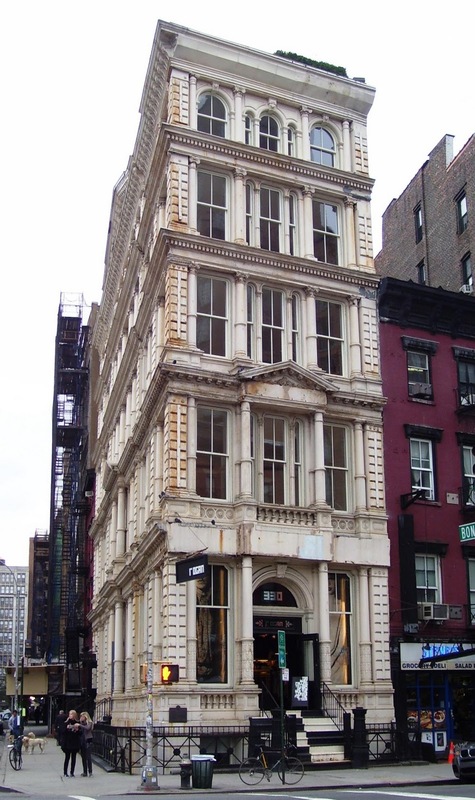 The brothers purchased three lots in the middle of the block, between 5th and 6th Avenues and commissioned German-born architect Henry Fernbach to design their store. ﻿﻿In a forward thinking innovation at the time, the Stern brothers installed a dining room for employees in the basement . A separate carriage entrance on 22nd Street ensured that the wealthy customers did not have to rub shoulders with the more common shoppers entering on 23rd Street and doormen in silk top hats held the doors. Invitations were sent to preferred customers and private showings were held annually when new fashions were introduced. Within only two years the new store was too small. 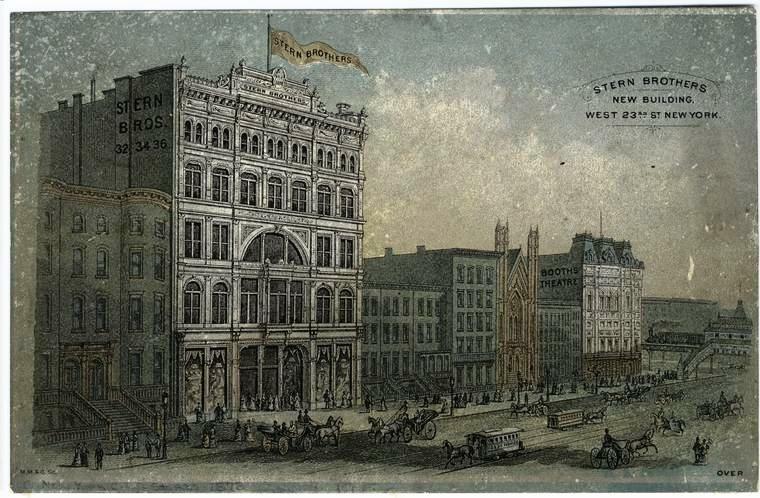 “The remarkable increase in the business of the Messrs. Stern Brothers, the dry goods merchants, has made imperatively necessary the building of a large addition to their already spacious store,” said The Times on August 6, 1880. The houses at Nos. 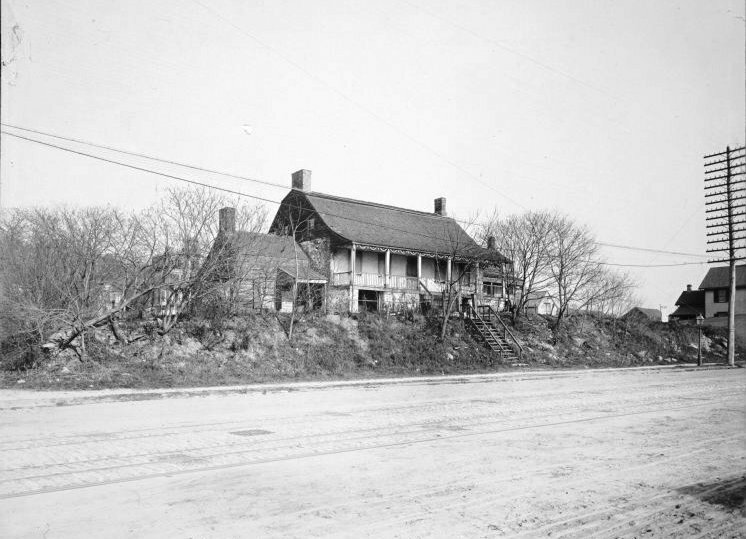 23, 25 and 27 to the east of the building were purchased and expansion begun. In order to rush construction, powerful electric lights were brought in so workman could work through the night. The extension did not pretend to be anything but an addition; there was no attempt to create the illusion that both sections had been designed together. Nevertheless the arched windows and connecting cornices joined the original to make a handsome façade. Their marketing strategies and diversity of merchandise worked. In 1885 another extension was planned. 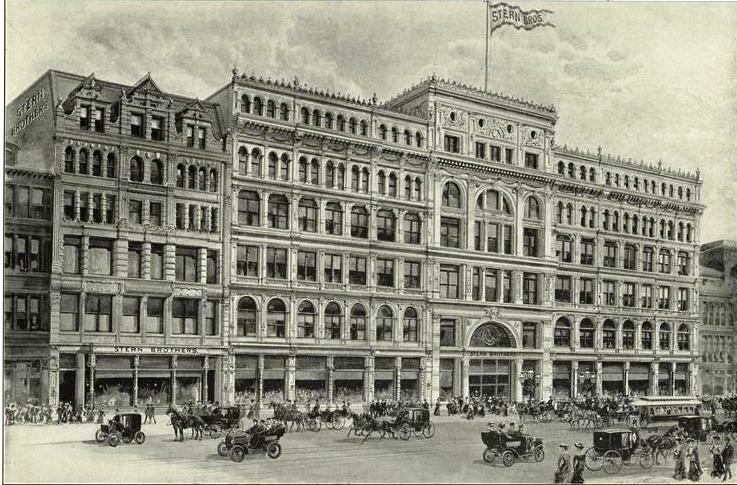 “Not content with the enormous business which they have heretofore done in their large establishment on West Twenty-third street, Stern Brothers last year determined upon enlarging their actual selling space and decided to build an extension to their building,” said The Times on September 21, 1886. 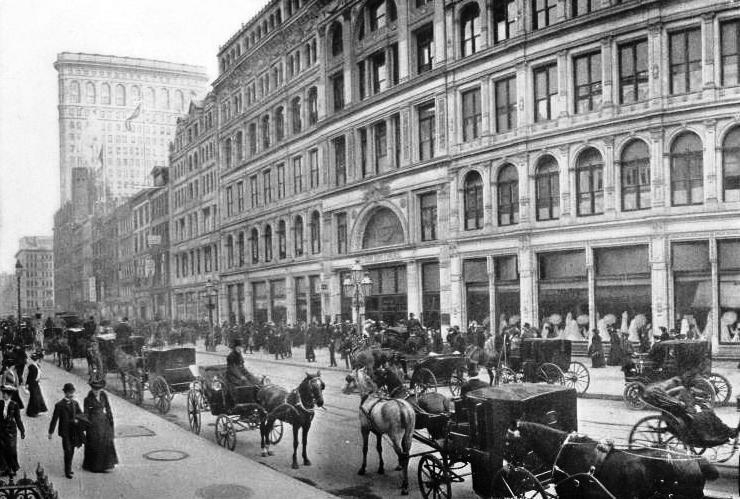 One hundred square feet of land was purchased between 22nd and 23rd street to the west of the building and on June 30, 1886 construction began. Within three months the $150,000 addition was completed, matching the first addition to the east. Sterns was now employing a staff of over 1500, there were 1800 incandescent lamps – the largest amount in any building to date – and thirteen elevators. 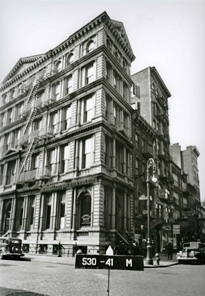 On the second floor was a “unique little reception room, fitted up with artistic taste for the lady shopper…and Stern’s to-day is the only place in the city where such a thing can be found,” reported The Times. The enormous space was still not enough and in 1892 Architect William Schickel enlarged the building for the final time. In 1902 Macy’s moved from 14th Street to its gargantuan new store on 34th Street, sparking the upward migration of the retail stores from the Ladies’ Mile. One by one the giant emporiums were abandoned until, on September 2, 1913 Stern Brothers joined the trend. 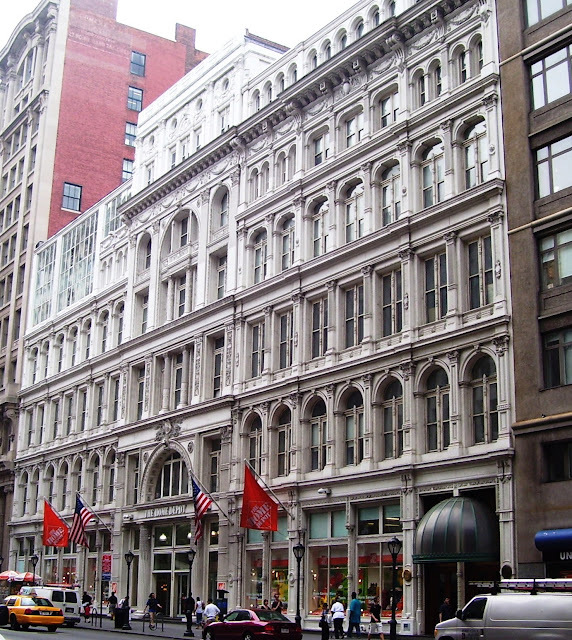 The gleaming white 23rd Street store was emptied as Sterns moved north to 42nd Street. The elaborate cast iron building that a century later the AIA Guide to New York City would say “reeks of birthday cake with vanilla icing” slowly declined. By mid-century it had been converted to industrial and warehouse use, with a mish-mash of street-level stores. Change came in the 1980s as the Ladies’ Mile buildings began being rediscovered. Hasbro Toys transformed the rusting structure into its offices and showroom. To prevent espionage of next season’s products, the company blocked out the ground floor windows. Stern Brothers became widely known as the Hasbro Building. It was during this time that the Tom Hanks motion picture Big used the building as the headquarters of MacMillan Toy Company where Josh Baskin went to work. In 1986 an well-intentioned but unfortunate updating by Rothzeid Kaiserman Thomson & Bee removed much of the easterly two floors, replaced by glass curtains; exceptionally out of keeping with the architecture. In 2001 the toy company decided to relocate and the 120,000 square feet it had occupied became available. An unlikely tenant, Home Depot, took over the space in 2004 and Stern Brothers’ immense emporium shines again. 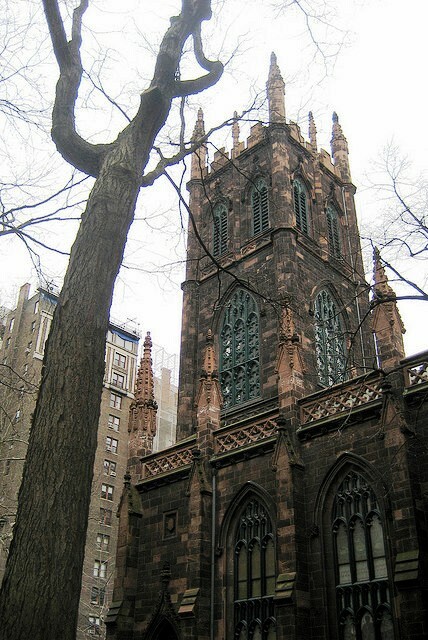 From the beginning of the 18th Century throughout the 19th Century, New York was dominated, mainly, by Anglicans (or Episcopalians post-Revolution). Their patience with the immigrant Scots and Irish Presbyterians was short at best, yet the original persevering group of eighty worshippers organized the First Presbyterian Church congregation in 1716. 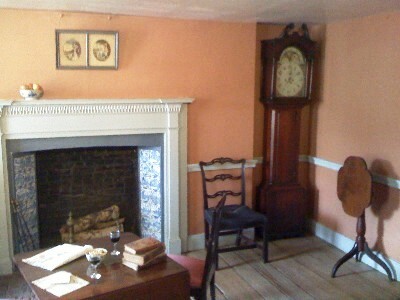 Their little church on Wall Street was closed throughout the American Revolution when the British occupied it first as a barracks and later as a stable. 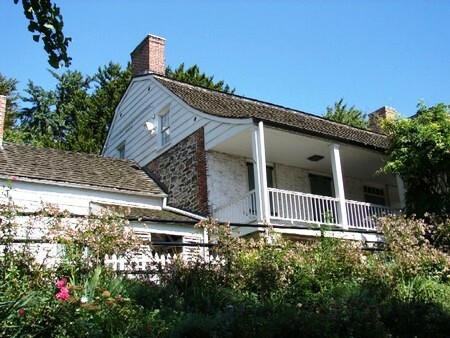 It was essentially destroyed in the Great Fire of New York in 1776 and the two subsequent buildings were also destroyed by fire, the last in 1835. 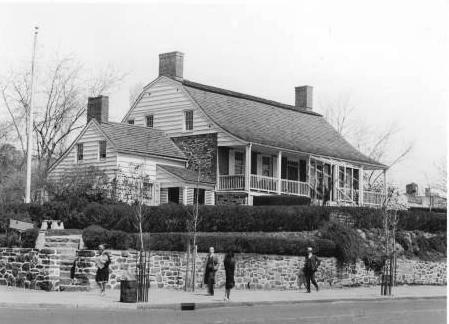 By this time New York was spreading northward and after lengthy discussion, land was purchased uptown on Fifth Avenue at 12th Street around 1844 in the growing Village of Greenwich. Around Washington Square to the south, fine Federal mansions had already begun rising. English-born architect Joseph C. Wells was given the commission for the Gothic Revival building. Wells based the bulk of the building on the Church of St. Saviour in Bath, England and modeled the central tower on the Magdalen Tower at Oxford. 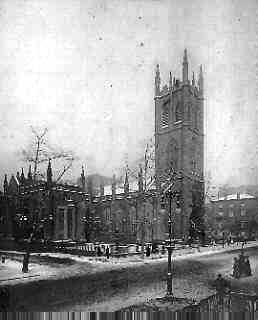 Interestingly, the same tower had inspired Richard Upjohn for his Church of the Ascension just one block to the south, completed in 1841. 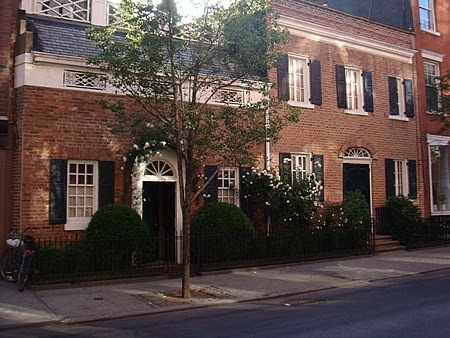 ﻿﻿ Wells made optimum use of the broad block-wide lot, setting the brownstone structure back from the street and surrounding the grounds with a heavy cast iron fence. Rich Gothic tracery both in the tower and large side windows were complimented by stone quatrefoils along the roofline. 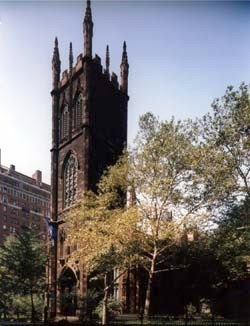 The Wall Street churchyard was excavated and the deceased reinterred in the south lawn of the new church, according to former deacon John Rhodes. The gravestones, however, were never re-erected. Throughout the 19th Century memorial windows were donated by members of the congregation, including three by Tiffany Studios, two by Charles Lamb and five by Maitland Armstrong. In 1893 McKim, Mead & White, then the foremost architects in the country, were hired to design a south transept; creating one of the most picturesque corners in the city. Two nearby congregations merged with First Presbyterian in 1918 and, at the same time, called upon fiery Baptist minister Dr. Harry Emerson Fosdick to be associate pastor. Fosdick was renowned for his outspoken opinions against racism and social injustice. A year later interior renovations were initiated when a chancel was added and the reredos, painted in 1917 by Taber Sears, was relocated to that new wall and repainted. The striking blue rose window was donated by Robert W. de Forest as part of the renovation. Completed in September 1920, the 40-foot extension and interior changes, designed by architgect John Almy Tompkins of the firm of Grosvenor Atterbury, cost more than $250,000. In the meantime, Dr. Fosdick’s popularity grew as did his following; the church membership burgeoning to 1,800 congregants. His rhetoric however, offended fundamentalist members and in 1924 amid great controversy and dissention, he resigned his post. On October 23, he spoke publically in the church after formally resigning his position a few days earlier. Crowds jammed Fifth Avenue, tying up traffic in an attempt to hear his final words. ﻿﻿﻿﻿﻿﻿﻿﻿﻿In addition to the quatrefoil design, Tafel colored the brick of the new building to match the brownstone of the church. The $1 million addition was dedicated on May 15, 1960. The handsome iron fence was restored in the 1980s and a decade later a major restoration of the south wing was completed. First Presbyterian’s tradition of support for social justice and tolerance lives on today. The racially-mixed congregation is gay-inclusive and is active in a homeless shelter program. 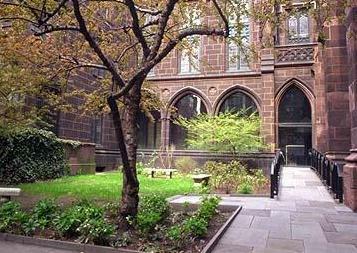 The handsome English church and churchyard on lower Fifth Avenue remains a serene and welcoming oasis. The bank was making a big move. The Bowery in 1874 was a thriving, exciting thoroughfare lined with German beer gardens and dance halls, theatres and businesses. The directors of the Atlantic Bank recognized the potential and the distinction of the area. 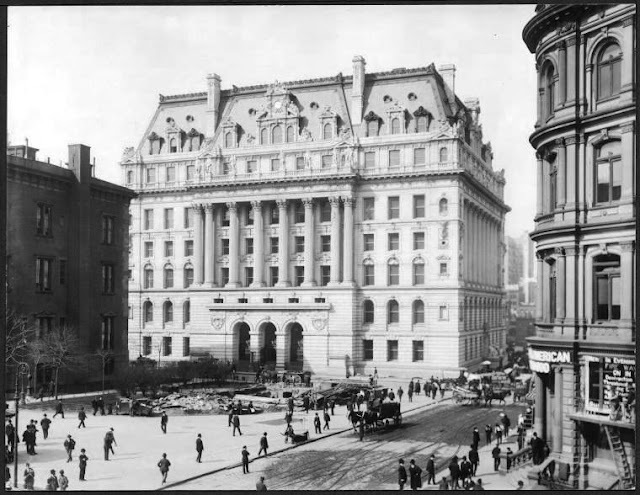 Henry Engelbert, who had designed the fashionable Grand Hotel on Broadway and the renovation of old St. Patrick’s Cathedral in 1868 and three years later the gargantuan Broadway Central Hotel, was given the commission for the new bank. As he did in the two Broadway hotels, Engelbert designed the bank in the French Second Empire style, although passing on the mansard roof for this project. The plot of land with which he had to work, which cost the bank $89,500, was long and narrow; a long slice of Bond Street terminating on the Bowery. The architect solved the problem by treating both facades similarly; giving neither special importance. The result was an especially handsome cast iron structure. Stately columns, coupled on the Bond Street side, flanked the windows and an daunting cornice topped the fifth floor. A shallow pediment crowned the Bond Street side. Englebert’s cast iron design masqueraded as stone, giving the bank building an aura of solidity. To unify the two facades, he ran a cornice course around the building between each floor. The bank was, however, the victim of bad timing. The year that the land was purchased and the new building project was initiated, the Financial Panic of 1873 set in, a great depression that would last for six years. Two years after opening, the Bond Street Savings bank failed. On September 21 the bank ceased operations under order of the Supreme Court. 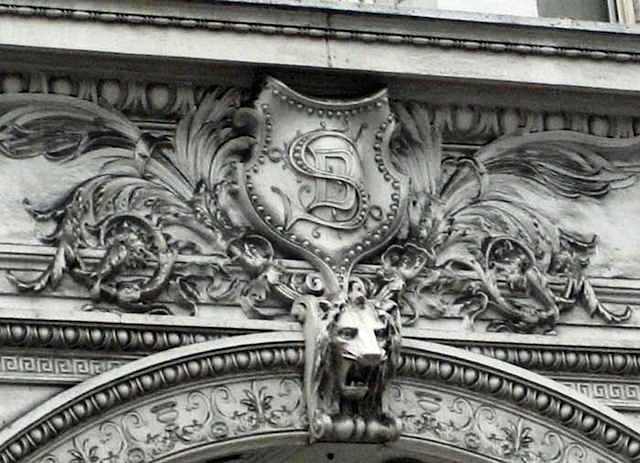 The German Exchange Bank took over 330 Bowery. 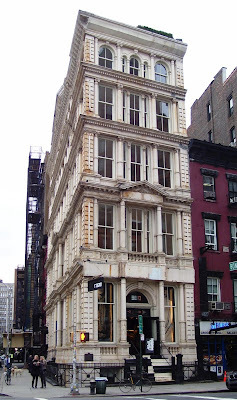 In 1885 it was leasing a corner space to Clark R. Trumbull’s stationery store. In 1918, with World War I anti-German sentiment rampant, the bank changed its name to the Commercial Exchange Bank and continued doing business. The Bowery, however, radically changed. Its reputation changed from an entertainment district to one of derelicts and drunkards. Reputable businesses moved away and buildings degraded through neglect. The Commercial Exchange Bank left No. 330 Bowery and the building was used for various purposes for a while; then was essentially abandoned for half a century, rusting and boarded up and used for storage. 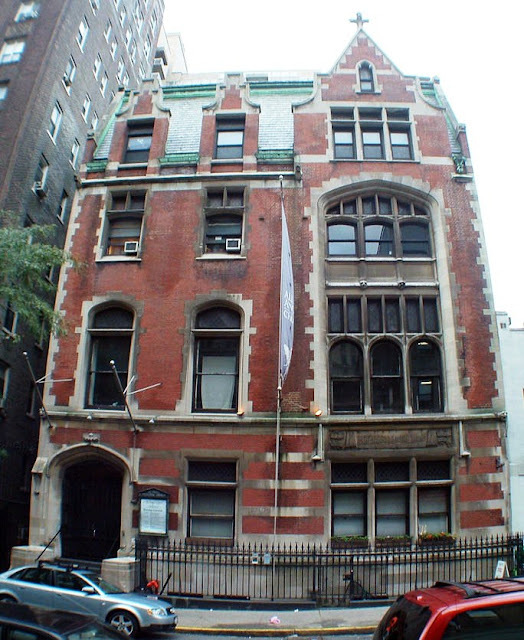 In 1963 salvation for the grand old building came when Honey Waldman converted it into an off-Broadway theatre called the Bourwerie Lane Theatre. 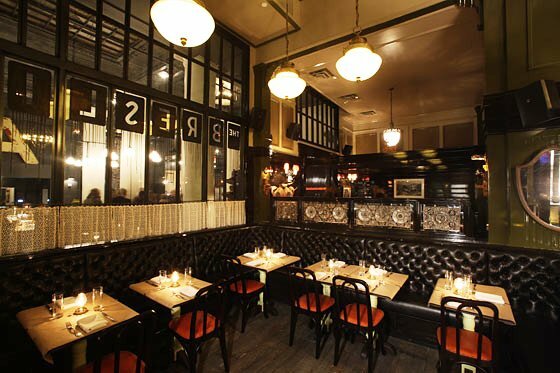 Resurrecting the Bowery’s tradition of theatre entertainment, the unexpected venue in the still-gritty area featured well-known stars and became a popular destination for theatre lovers. In its first year the theatre staged The Immoralist with Frank Langella. In 1974 it became home to the Jean Cocteau Repertory Theatre for 32 years. When the curtain dropped on Jean Genet’s The Maids X 2 in 2006, the theatre closed it doors for good. A year later in June businessman Adam Gordon, known as the Self-Storage King, purchased the now-landmarked building for $15 million with the intention of creating a sensational residence for himself on the upper-most floors and “respectable” retail spaces below. The owner’s penthouse was ample – a full 4,863 square feet of interior space and 1,277 square feet of terraces and rooftop garden space. Pocket doors, 10’4” ceilings, and two full kitchens added to the comfort. The unsightly fire escapes that clung to Engelbert’s stately façade could now be stripped away. To recreate the appearance of 19th Century glass in the residential spaces, the window glass was machine-rolled using the same process as the original. The method creates minor distortions as would be expected with vintage glass. The window sashes were reproduced in wood, carefully retaining the original designs. In February 2010 Gordon put the three residential properties on the market; his penthouse at $15.45 million, the fourth floor apartment for $4.95 million and the third floor residence at $4.875 million. 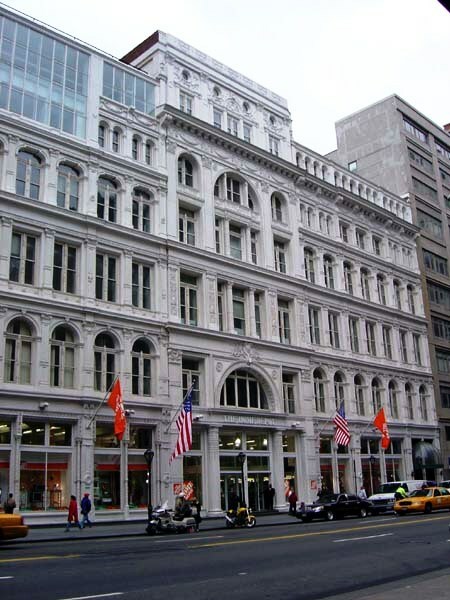 The entire building including the lower two floors of retail space was marketed at $34 million. By the second half of the 19th Century the need for a larger, more secure hall of records was evident. The population of Manhattan had grown from 61,000 in 1800 to 942,000 in 1870. Necessarily, as the population burgeoned so did the amount of paper records to be archived. In 1888 the Sinking Fund Commission was formed to erect the new facility. Concurrently, a plan to demolish the elegant 1803 City Hall was initiated and John R. Thomas won the commission for its replacement with an exuberant Beaux Arts design. Thomas was a prolific architect credited with designing more public and semi-public buildings than any other designer in the country, including armories, the old Stock Exchange and more than 150 churches. Public outcry against the demolition of City Hall was immediate and strong. Subsequently the State Legislature voted down a new City Hall and, as compensation, the commission for the new Hall of Records was given to Thomas. It would be nearly a decade before the city obtained the land for the new building. The Board of Estimate and Apportionment met on December 16, 1897 to award the building contract to John Pierce, who had bid $1,997,900. The board estimated the total cost to be $2.2 million. By the time the building was finally completed that figure would rise to $8 million. Thomas’ plans, a gentle re-do of his City Hall design, were approved by an advisory committee of William E. Ware of Columbia University’s Architectural School, noted architectural critic Montgomery Schuyler, and Metropolitan Museum trustee Henry G. Marquand. It was a grand French Beaux Arts building in keeping with the new City Beautiful Movement. The theory of the movement held that monumental and classical buildings would not only beautify the urban area, but citizens who were surrounded by civilized structures would behave in a civilized manner. Thomas’ Hall of Records would be monumental beyond imagination. A lavish mansarded giant constructed of granite from Hallowell, Maine (the same quarry used for the stone of the State Capitol building), it would be embellished with sculptures on three levels. Groupings closest to street level would depict “various races and nations,” the second tier would be portraiture of distinguished city fathers, while the uppermost sculptures would be allegorical. 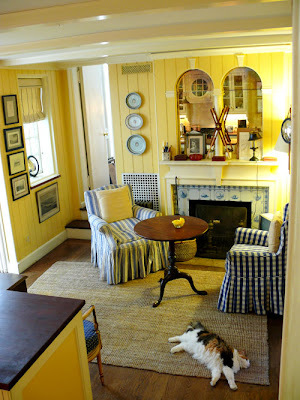 As sumptuous as his exterior design would be, the interior was doubly-so. Opulence was created with yellow Siena marble, mahogany woodwork, and an intricate arched mosaic ceiling in an Egyptian motif. White marble sculptural groupings of “The Consolidation of Greater New York” and “Recording the Purchase of Manhattan Island” would sit above the east and west doorways. 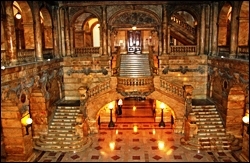 The inlaid foyer floor would be of pink Tennessee and Blue Beige marble, illuminated by a bronze chandelier and wall sconces; even the radiator covers would be bronze , topped by spread eagles atop globes. 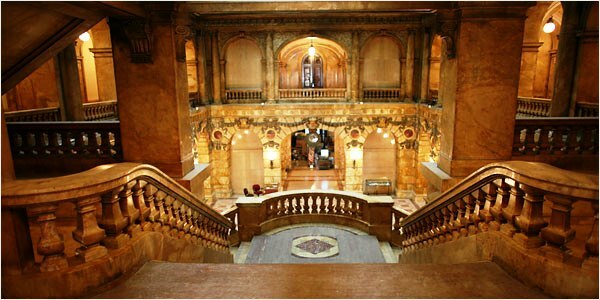 If the visitor was struck by the foyer, he would be awed by the lobby where a grand baroque split staircase rose two floors to a balustraded level. A century later, author Bill Harris in his “One Thousand New York Buildings” said “Want to see the Paris Opera? 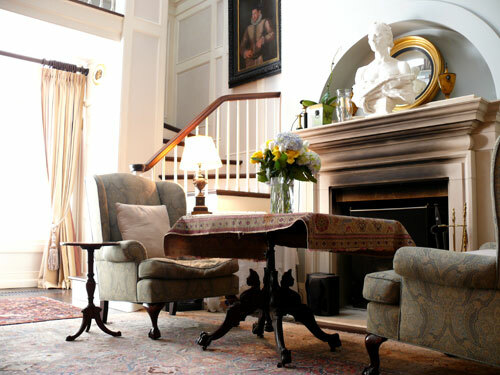 Step into the lobby right here.” Thomas’ interior design was one of lavish theatricality. Ground breaking did not occur until 1899 and the cornerstone was laid in April 13, 1901. Shortly thereafter, on August 28, John R. Thomas died unexpectedly. Reaction on the part of the new Tammany-backed Mayor Robert A. Van Wyck was immediate. He gave the job of completing the project to architects Horgan & Slattery, also connected to Tammany Hall. The firm recommended various alterations to the plan, which The New York Times grumbled was “horganizing and slatterifying” the design. On April 28, 1902 the first of the eight mammoth granite columns was hoisted into position. Carved in a single piece, it was 36 feet high, 4 feet two inches in diameter and weighed 41 tons. 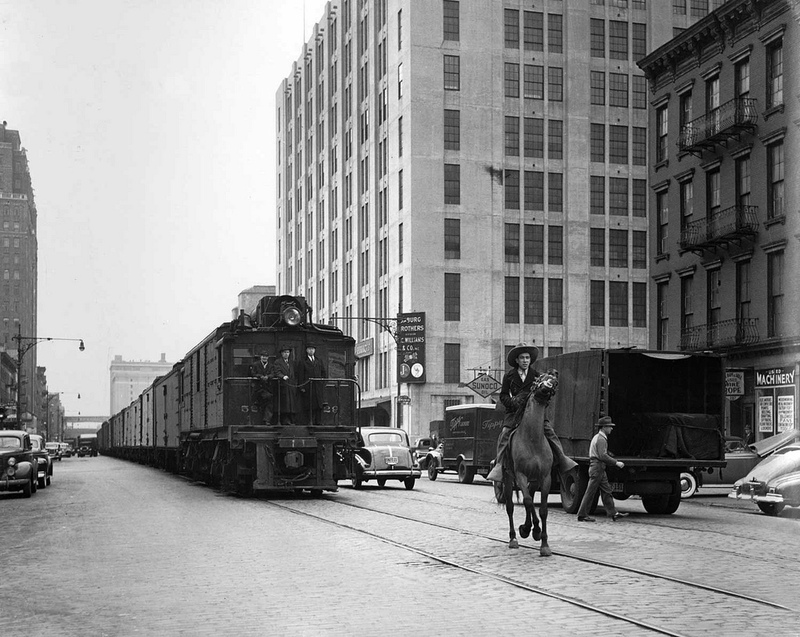 Transporting the monolith from Pier 1 took a team of 21 horses. Thomas had given the commissions to two sculptors only, H. K. Bush-Brown for the roof sculptures and Philip Martiny for the rest; far too much work for the allotted time. Martiny did his work at the Hallowell, Maine quarry where the stone for rest of the building was cut. As work progressed, delays were caused when his plaster casts for the statue of former Mayor Hewitt were rejected four times. Finally on December 8, 1905 the finished 12-foot, four ton statue was completed and prepared for hoisting into place on the cornice at the sixth floor. When the sculpture was about two and a half feet from the cornice, the main boom of the rigging snapped, sending the statue plummeting to the sidewalk where it smashed. Luckily, because of the long construction process, a new mayor took over and most of the changes to Thomas’ original design were reversed. 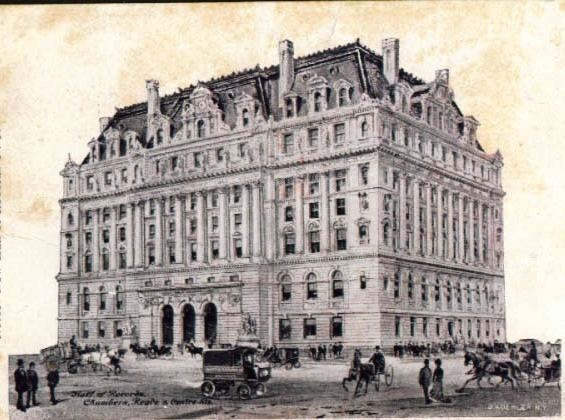 Nevertheless, as city workers began moving in to their offices in 1906 they were shocked to find that the gray and white marble on the upper floors was actually plaster. Amid the controversy, Horgan & Slattery publically admitted the substitution of materials was a mistake. 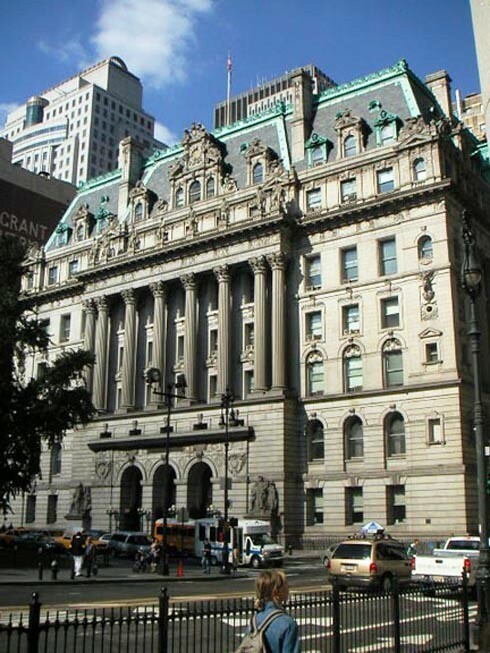 In 1961 when Centre Street was widened, the two sculptures flanking the entrance were removed to the front of the New York County Courthouse at 60 Centre Street. A year later the Hall of Records was renamed The Surrogate’s Courthouse. The building that the Work Progress Administration’s “New York City Guide” pronounced in 1939 “New York’s best example of eclectic baroque style used in French nineteenth-century municipal buildings,” was deemed a New York City landmark in 1966. 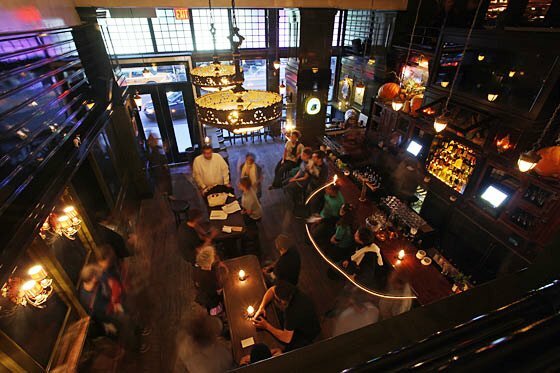 A decade later the interiors were also given landmark status. When opened, the Hall of Records was called “the most Perisian thing in New York” and a century later it could still hold that designation. 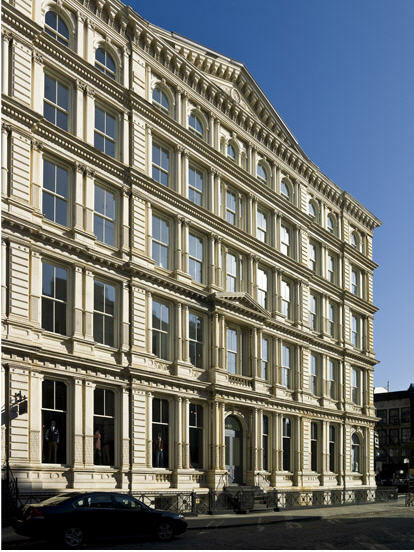 In 1878 Miers Coryell, an expert in marine engines, and his wife Marie commissioned architect Bruce Price -- who would be remembered for buildings like Quebec City’s Chateau Frontenac -- to design an apartment building at 21 East 21st Street in the latest American Queen Anne style. Working with builder David H. King, Jr., who would become famous for more memorable structures like the Cornelius Vanderbuilt mansion, The Knickerbocker Club and the original Madison Square Garden, Price produced a Victorian delight. At a time when apartment living was a novel idea among the financially comfortable, the apartments – one to a floor -- offered a parlor and master bedroom to the front, three additional bedrooms, dining room and, to the rear, a servant’s room and kitchen. A circular staircase at the front of the building was intended for guests and residents; a smaller one at the rear was for deliveries and servants’ use. The architect (whose daughter, Emily Post, would go on to fame as the American dictator of etiquette) used red brick trimmed with carved limestone and white terra cotta to create visual interest and touches of tongue-in-cheek humor. 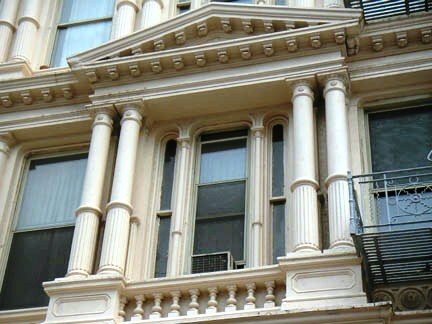 The three-story bowed oriel bay with its many-paned windows is supported by fanciful corbeled medieval pillar; what the AIA Guide to New York City called “a marvelous example of late Victorian structural whimsy.” Above the oriel, a semi-circular balcony is protected by a simply iron railing. The sixth floor has a steeply slanted roof with two charming and decorative dormers. Carved into a stone over the doorway Price put “MC,” for Miers Coryell. He also included both his own name and that of the builder flanking the date stone. A year later a resident placed an ad for “an excellent cook, who will also wash bed and table linen.” Within the decade, in 1890, the first floor apartment was renting for $1,400 a year. Trouble came in 1901 when one of Price’s architects, Count Jules Henry De Siborn, accused a new “hallboy," Ulysses Oppenheim, of stealing $84. The New York Times reported that the Count “lives in the fashionable apartment house at 21 East Twenty-first Street.” The hallboy disappeared. The “fashionable” spirit of the apartment house quickly faded and by 1911 Dr. Wickes Washburne had established his office of psychiatry here. Little by little the apartments gave way to other uses and in 1919 it was the headquarters of the Pressmen’s Union and later the home of the American Institute of Phrenology. 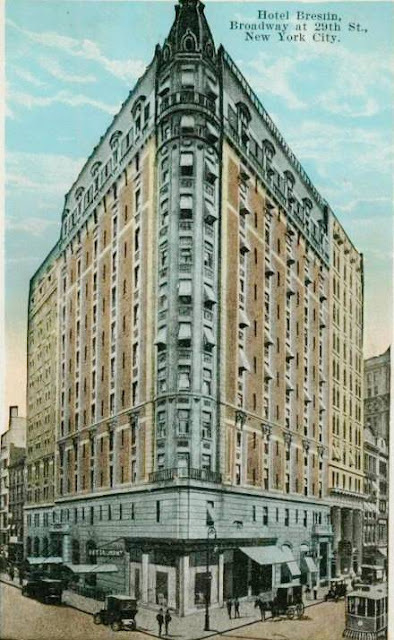 In 1953 the once-fashionable apartment building was renovated into a “Class B Hotel.” The floor-long apartments were cut up into seven rooms to a floor, the sixth floor carved into ten rooms. In 1977 the hotel was closed and the interiors gutted for a conversion to an apartment house. Opened a year later, it now houses 26 apartments. Today No. 21 East 21st Street looks remarkably unchanged on the outside; although there are severe alterations to the stoop and basement level and a truly unfortunate choice of entrance doors. Overall, however, Bruce Price’s eccentric design lives on and the fantastic little column still catches the eyes of passersby.